Other triggers that contribute to melasma development are sun exposure, birth control pills, hormone therapy, cosmetics, anti-seizure drugs, and a family history. In addition to the face, melasma patches may appear on the forearms or neck. It is not harmful, but it is considered unattractive and many women seek treatment to feel more confident about their appearance. Another common characteristic of the disorder is that it occurs more often in people with skin of color. The reason for this relates to the physiological changes that cause melasma, which are over-production of melanin, the pigment responsible for the color in our skin, hair, and eyes. People of color have more melanin in their skin, thus more melasma. The first line of defense against these unattractive patches is sun protection. Sunlight triggers melasma, and even if your symptoms have faded, a few minutes of UV exposure will cause them to return. Wear a broad-spectrum sunscreen every day with an SPF of 30 or more. Look for sunscreens with zinc oxide or titanium oxide to physically block the sun’s rays, and remember to reapply every two hours when you are outdoors. Sun protection is a good first step but may not affect persistent cases. In these instances, patients must seek the professional assistance of a dermatologist. I have long been a strong proponent of hydroquinine and when used in reasonable concentrations, under physician supervision, hydroquinone is safe and effective for pigment problems including sun damage, melasma, and post-inflammatory hyperpigmentation, In my practice, I have found 4% concentration of hydroquinone, used for four to six months, to be the most effective. After this time period, some melasma patients stop showing improvement in their skin pigmentation. Seeking to save money on office visit fees and prescription medications, patients will buy hydroquinone from the Internet, never suspecting that it could actually be making their condition worse when used on a long-term basis. Subsequently, continued treatment with hydroquinone (or other medical-grade skin formulations, for that matter) indefinitely—without the oversight and expertise of the dermatologist who originally prescribed it—often creates dermatologic disasters. Following are some patterns that I increasingly see among patients in my clinical practice, which have lead me to prescribe hydroquinone alternatives. The reasons that hydroquinone alternatives are becoming increasingly popular go far beyond consumers’ fears of irritation, flaking, and risk of skin cancer, which, in my opinion, has never been firmly substantiated by studies. Even under the best medical supervision, patients can develop resistance to the lightening effects of hydroquinone. In my practice, I have found 4% concentration of hydroquinone, used for four to six months, to be the most effective. 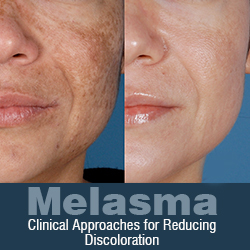 After this time period, some melasma patients stop showing improvement in their skin pigmentation. No longer affecting the dark spots of melasma, the bleaching effects of hydroquinone appear more pronounced in the unaffected areas of the face. In fact, as the active melanocytes in the affected areas develop resistance to hydroquinone, the patient’s hyperpigmentation in these areas worsens. To avoid such problems, I recommend that after no more than six months of hydroquinone application, all patients should cease using this drug for two to three months. This allows melanocytes to stabilize (so they can withstand external and internal factors that might otherwise increase their activity) and restore the skin’s natural melanin. During this phase, melasma patients can use other lightening agents, then resume hydroquinone if necessary afterward. Some dermatologists may choose to treat resistant melasma by increasing the concentration of hydroquinone. I strongly advise against this approach. Patients respond well to aggressive application of 4% hydroquinone combined in equal parts with retinoic acid for four to six months. This combination accelerates achievement of a more natural and even skin tone. After six months, patients should discontinue use of this mixture in favor of retinoic acid alone for two to three months, after which they can resume hydroquinone treatment, if necessary. Sun exposure is the main culprit causing the over production of melanin, but exacerbating factors including hormonal fluctuations, acne, medication, aesthetic treatments, and any condition causing redness and inflammation can enhance the discoloring effects of UV exposure, including the overuse of hydroquinone. Some patients use hydroquinone indefinitely, thinking it will prevent unwanted pigmentation. But we now know that decreasing the amount of melanin in skin, as hydroquinone does, creates photosensitivity. Without proper sunscreen use (sun protection factor/SPF ? 30, frequent reapplication), photosensitivity leads to inflammation, which stimulates melanin production. The sun can also affect melanocytes directly, increasing melanin production and possibly leading to rebound pigmentation. In addition, phototoxic reactions can trigger a chemically altered bluish melanin compound that’s responsible for ochronosis, which is tough to treat because it involves pigmentary changes deep in the dermis associated with altered skin texture. Physicians used to believe that ochronosis was limited to certain African tribes, and that it stemmed partially from genetic causes, partially from prolonged hydroquinone use. However, in the last few years, I have observed a higher incidence of ochronosis not only in African-Americans, but also in Caucasian, Asian, and Hispanic patients who have used various concentrations of hydroquinone, often for years on end. In these patients, ochronosis has occurred in the areas of the face that experience the most sun exposure. Using multiple modalities such as chemical peels, intense pulsed light, and fractional laser treatments simultaneously with continuous hydroquinone also contributes to the occurrence of ochronosis. This serves as a reminder that when treating melasma, we should not use exfoliative procedures, chemical peels, laser resurfacing, or other thermal rejuvenating devices as our first step. Rather, I recommend proper skin conditioning—using hydroquinone, hydroquinone plus retinoic acid, alpha hydroxy acids, antioxidants, and any disease-specific agents necessary—for four to six weeks before, and after, any procedure (once skin healing is complete). This helps to restore normalcy and functionality to the skin and improves the results from procedures. Consumers can readily find products that combine hydroquinone with various ingredients such as retinoic acid, glycolic acid, vitamin C, and topical steroids. However, prolonged use of such products can, in some cases, worsen melasma and create additional issues. This is especially true of products that combine hydroquinone, retinoic acid, and steroids, and the combination of hydroquinone, tretinoin, and fluocinolone. I have found that long-term use of such products can lead to skin atrophy, the appearance of burst blood vessels, skin sensitivity, and, frequently, more stubborn pigmentation than the patient originally had. The topical steroids in these formulations aim to suppress inflammation. This is critical because inflammation excites melanocytes, which stimulates melanin production. However, topical steroids only work on pigmentation induced by trauma or disease (PIH). In contrast, we must avoid prescribing topical steroids for patients with pigment problems not caused by inflammation, such as melasma. Moreover, to avoid disrupting cellular function, these triple-combination products should not be used for longer than five to seven days, in accordance with their instructions. As an alternative, I prefer the combination of hydroquinone and retinoic acid without a steroid. It is safer, yet quite effective when used properly for four to six months with strict sun protection. In addition to the patterns discussed above, non-hydroquinone brightening agents may be prescribed instead of hydroquinone as a healthy maintenance system and to avoid atrophy, carcinogenesis, and other local or systemic side effects with long-term exposure. Doctors should have multiple options at their disposal and be able to choose the right one for their patients. Non-hydroquinone protocols do not bleach, but rather stabilize cells, in order to stop the melanocytes from being active all the time. The objective is to reduce melanocyte hyperactivity. Through careful management of hydroquinone usage—optimally four to six months at the maximum—followed by non-hydroquinone treatments for maintenance, melasma can be lessened and controlled. Every case is different, and some patients require additional modalities, such as chemical peels or laser treatments, although in many instances topical treatment is adequate as a solo approach.